The story of our redemption resonates with even the youngest. We are happy to bring that story to children through our Easter Story collection. All the gifts in this wonderful collection contain exclusive, full-color artwork and are sure to be a hit with kids of all ages. 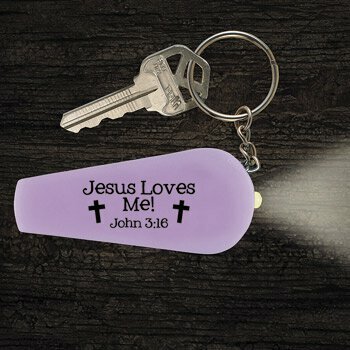 This glow-in-the-dark key chain is fun and functional. The LED light turns on with a push of a small button. Flashlight also has the ability to function as a safety whistle. 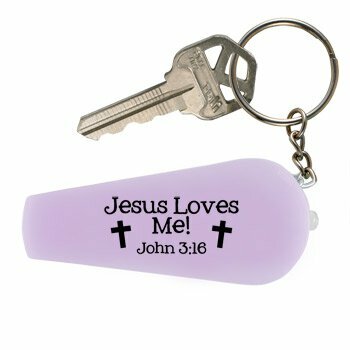 Comes with the wording "Jesus Loves Me!" and references Bible verse John 3:16. Shop our entire Easter Story Collection!